Has anyone ever told you that “practice makes perfect?” I am sure you’ve heard this saying so many times, either from one of your parents or from a personal coach. Today, however, I am here to tell you that you cannot believe in that saying. The moment you even start thinking that you have become, “perfect,” is the moment you will fail at whatever skill you are practicing. If Mozart thought he had perfected music, don’t you think he would’ve stopped? If Michael Jordan thought he was perfect at basketball, wouldn’t he have stopped going to practice? And if David Beckham was the “perfect” soccer player, wouldn’t he consistently be outscoring everyone? The reason I’m telling you all this is because to start improving your soccer skills, you should realize that there is never going to be an end goal. This isn’t a bad thing; this is a great thing that will keep you excelling and going whenever times seem tough! It can be quite the challenge to improve soccer skills; it takes a lot of patience, determination, and so much passion! You must know what position you want to play and what exact soccer skills you want to improve over time. If you make a plan, and stick to it, I promise you will be on your way and improve your soccer skills! 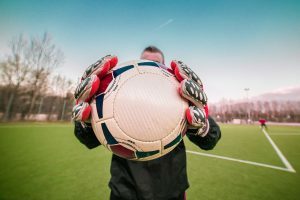 If you are a beginner in soccer, or if you haven’t played in a while (or have never played at all) then this section is for you. Soccer may seem like an easy sport to play to many, as professional players make it look easy. However, I must tell you that it is quite difficult and takes a person who has a lot of endurance. Therefore, to improve soccer skills, you must first improve your own body. If you do not feel that you can successfully run for at least 25 minutes straight, you are not ready to step on that field! Go to the gym and hit the treadmill and start your endurance training. Soccer is a game that lasts overtime, and you must play at the same level throughout the game. It is useless to a team if their great player plays amazing for ten minutes and then loses all that momentum. So, first and foremost, get to the gym and start increasing your power and the duration of your workout. This may take some time, but it is well worth it to increase your potential once you get on the field. When you get on the field it is now time to improve your soccer skills. Obviously, all you will need is a ball and another person with you. The reason I say this is for most of the exercises and drills you will learn, you need someone to pass to, and also act as an offensive or defensive player. Starting out, or even if you are a professional player, it all goes back to the three basics: passing, dribbling, and shooting. Without these soccer skills, you simply cannot play, and therefore will not win a game. To improve your soccer skill of passing, you have to learn how to pass powerfully, but more importantly, accurately. You must also learn to pass while running and at game speed. Many drills make you pass while just standing, and I think those are pointless. Run up and down a field with a friend, and continuously pass the ball back and forth. Learn to pass with both the outside and the inside of your foot. Dribbling is essentially the only way to maintain possession of the soccer ball. It is a way to get around defensive players and make your way towards the goal. Improve this soccer skill by dribbling around your friend (playing defense) every single day. It will improve your ability. This is the most important aspect of soccer as this is how you win the game. Place your partner in the net and shoot from all over the field. This will let you know how much power you have to improve, and overtime will improve your aim. I wish you all the best while you improve your soccer skills!